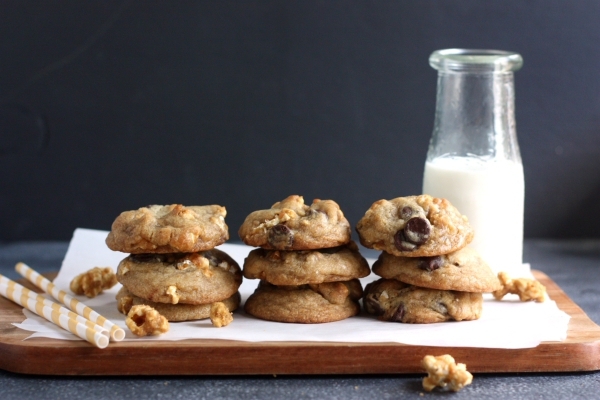 Not your average chocolate chip cookies, these come packed with crunchy caramel popcorn. Some desserts are just so brilliant, that you almost want to smack yourself in the head and think “of course! why didn’t I think of that?”. 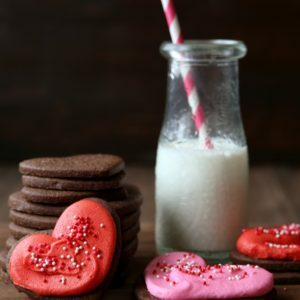 The buttered popcorn cookies from The Smitten Kitchen Cookbook is one such recipe for me. 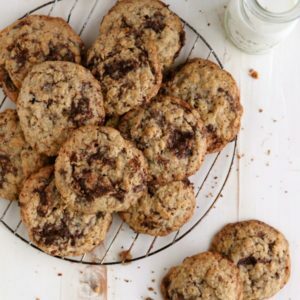 One of my most favorite snacks, baked into a cookie. Genius! Only, when I finally got around to baking a batch, I couldn’t leave it alone. So I added chocolate chips. And crunchy caramel popcorn. And my tinkering paid off! 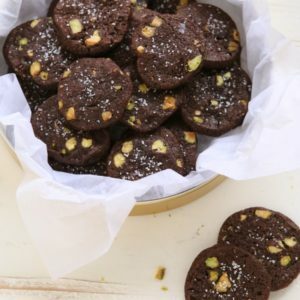 These cookies are fabulous and incredibly addicting, so bake with caution. I love how the caramel popcorn enhances the butterscotch flavor of the cookies and the added texture is so fun. 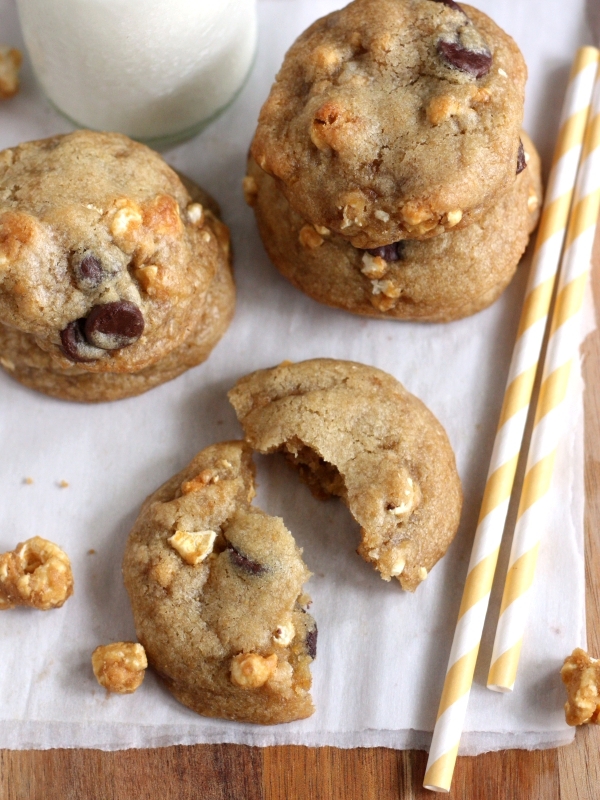 Some kernels seem to melt into the cookie, leaving behind a pocket of flavor. Others hold their shape and give a little crunch. Who knew it would be so fun to bake with popcorn? Put the popcorn in a large bowl. In a medium saucepan over medium low heat, melt the butter and sugar together. Once melting, increase the heat to medium and bring mixture to a boil, stirring constantly. Cook for 3-4 minutes, while continuing to stir. Remove from heat and add vanilla, salt and baking soda. Stir until smooth. Immediately poor caramel over the popcorn and stir so that the popcorn is covered evenly. Spread the caramel popcorn onto the prepared sheet pan and bake for 1 hour, stirring every 15 minutes. Let cool completely. Preheat oven to 375 degrees F. Line a sheet pan with parchment paper or a silicone baking mat. In the bowl of a stand mixer fitted with a paddle attachment, beat the butter and sugars together until pale and creamy. Add the egg, followed by the vanilla, mixing after each. In a bowl, combine the flour and baking soda. Add to the mixer and mix until combined. Add the chocolate chips and caramel popcorn and gently mix in. 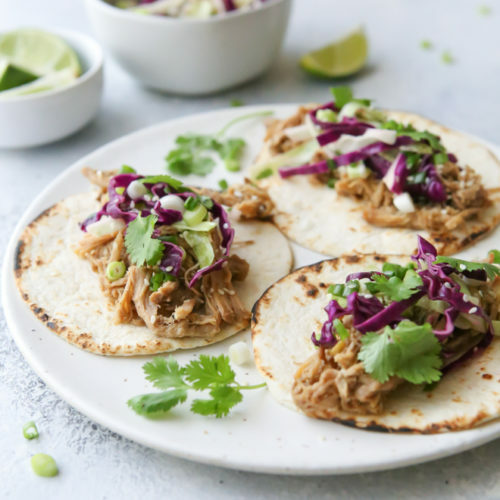 Drop into rounds onto the prepared sheet pans and bake until golden, about 10-12 minutes. Let cool on the sheet pan for 5 minutes, then transfer to a cooling rack to cool completely. Note: You'll have caramel popcorn leftover. Happy snacking! Cookie recipe adapted from The Smitten Kitchen Cookbook. I know, right?! 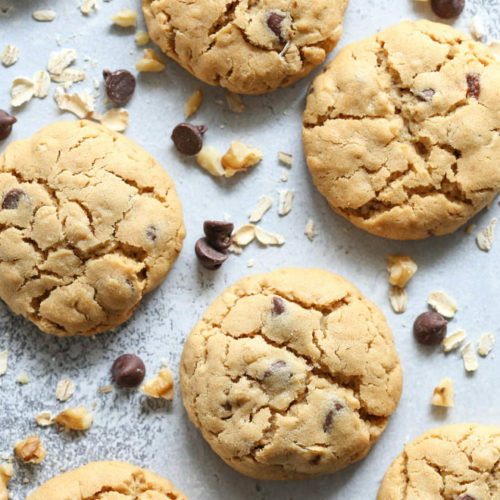 Bake a batch and you’ll wonder why you haven’t been baking popcorn into all of your cookies! So good! You are all kinds of brilliant, my friend. 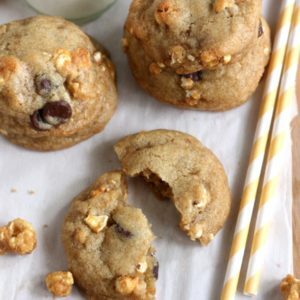 I never would have though to tuck caramel corn inside cookies, but it sounds irresistibly good. Yes! Absolutely gorgeous. They turned out even more gorgeous than I imagined. YUM! I meant to tell you yesterday that I tried them again and they were a huge success! Seriously, so good. Annalise these are just awesome!! Either Guittard, Ghirardelli or Nestlé, whichever is on sale! Need to try these!!! The popcorn must add such a cool texture!!! What a great idea to use Cracker Jack! I hadn’t even thought of that. Enjoy! Stovetop popcorn and a bit of honey in the caramel was utterly delicious. 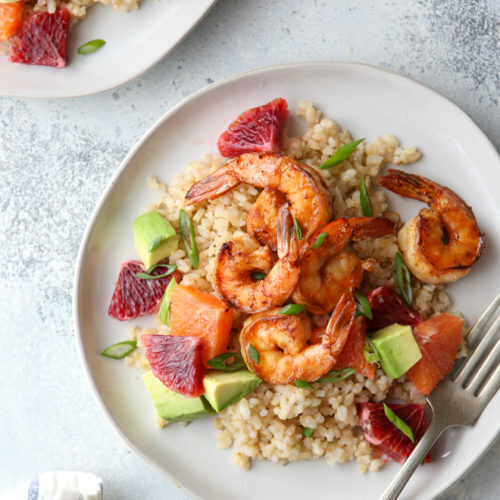 An excellent recipe!